Victoria: Do I need to Display my annual essential safety measures report? Earlier today I received an email from a customer saying that in Victoria the Building Commission was stating that it is still (5/2/2013) a requirement for building owners to display a copy of the Annual Essential Safety Measures Report. My initial reaction was to reply back and ask, where did she hear that statement? This might be my most controversial blog yet, but if it can help start to improve the standard and quality of the Occupancy Permits issued and that I witness then it may be worth the criticism! My contention is that many occupancy permits are poorly written and incorrectly identify items of equipment, features and measures that are not essential safety measures as prescribed in the Regulations. The results could be risking safety and costing building owners thousands of dollars. If you are a building surveyor or building owner or manager then you should read this article. In Victoria, an Occupancy Permit (OP) is a document (Form 6), specified in Part 10 of the Building Regulations 2006 (Vic) (the Regulations) as part of the building process. The Relevant Building Surveyor is required to issue either an Occupancy Permit or Certificate of Final Inspection after the mandatory final inspection at the completion of building works. Occupancy permits are documents that signify that a building surveyor is satisfied and has approved your building as being suitable for occupation. The Building Act 1993 requires the issue of an occupancy permit prior to occupation of a new building. An occupancy permit is not a statement that all the building work is necessarily complete. Nor is it a certificate that states that all building work complies with the relevant legislation or contract. 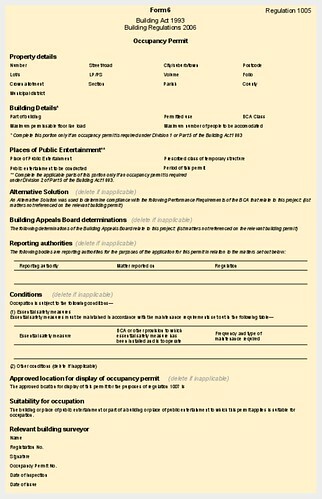 An occupancy permit is issued when your building is "suitable to occupy" from a health and safety point of view. An occupancy permit will only be issued to you when items affecting health and safety are in place and capable of being operational. These include things such as the water supply, sanitary and cooking facilities, smoke alarms, safety glass, handrails and balustrades. It does not mean that all the painting is done or that the carpet is laid, for example. In this article I am going to write about our observations regarding the Occupancy Permits, conditions for occupation comprising Part 1 - Essential Safety Measures and Part 2 Other Conditions Occupancy Permit or a document prepared by a Building Surveyor. Over the last few days, I have been preparing a presentation on Essential Safety Measures Maintenance in Victoria. This presentation was created in response to a general misunderstanding regarding compliance and the obligations of building owners. The presentation is available to view online. We also encourage you to pass this link on, so we can further educate the community on Essential Safety Measures Maintenance and Compliance in Victoria.